Tour Description: At Beijing airport meeting point, be met by our private English speaking guide and driver. Take about 1.5 hour’s drive to Badaling Great Wall. Badaling Great Wall is one of the most famous sections of the Great Wall, visited by more than 300 celebrities included President Nixon and Lady Thatcher. Hike the wall for as long as you can, to appreciate the watch towers, shooting crenels, the waving walls and rugged mountains as well as the lush green trees all around. Transfer you back to the airport. End of our service. Our flight arrive 12:45 am and we leave at 12:00pm . Is there a possibility to get a tour to the wall. Hi! Thank you for this amazing website! It is really helpful! Me and my fiancée are travelling through Beijing on our way from Vietnam and South Korea to USA. We land at 14:00 (2PM) and the flight leaves at 22:30 (10:30PM) so we have 8.5 hours in the airport. She is from Vietnam and I am from Norway. Would you advise us to go for the 24 hour layover visa or would you rather advise us to NOT book this trip? Thank you SO much for your honest answer. We will for sure use you on the next chance we have anyway. We arranged many tours for Vietnamese passport holders without visa. But the airport have right to stop you in the airport without any reason even was happened for the US passport holders. So if you want to be 100% sure, please apply for the Chinese entry visas in advance in Chinese Embassy. About how to get the visa-free permit. 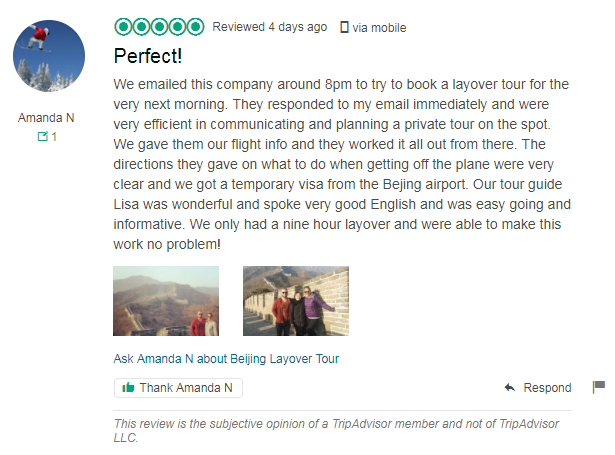 Please see details at: http://www.beijinglayovertour.com/beijing-layover-tour-tips/. And we just sent you an email about tour options, please check. Hello, Our flight arrives at 4:00 a.m. on April 29 and departs at 2:05 p.m. the same day. Would there be enough time to take the tour? But the airport have right to stop you in the airport without any reason even was happened for the US passport holders. So if you want to be 100% sure, please apply for a visa in advance. We just sent you an email about the details of the tour, please check. Our flight lands at 5am and our next fought leaves at 1pm. Will we have enough time? According to your layover time, we do not recommend you to book a tour. Because the immigration officers are capricious. They might not let you get out of airport. They will say you have no time to do the tour (Actually, you have enough time to do it). It happens recently with your same flights and time. Sorry about that! According to your layover time, we do not think you will have enough time to do a layover. But if you can apply Chinese entry visa in your country in advance, that will be no problem to do the tour. Do US citizens need visa? Also, what are the tour times? Yes, you need visa. If you apply Chinese entry visa in your country in advance, you will have time to do the tour. If you apply visa-free at Beijing airport, that will take more than 2 hours, so you time is no enough to visit the Great Wall. This is a private tour, we can pick you up from airport at 7am if you apply visa in advance. Yes, you will have enough time to visit the Great Wall and Tiananmen Square. We just sent an email about detailed tour itinerary, please check. My flight arrives in Beijing at 7:45am and departs at 4pm is that enough time for a tour? 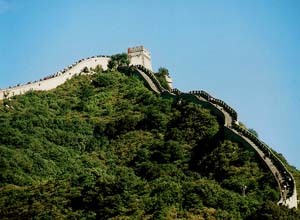 According to your arrival time, you can visit the Great Wall if your flight arrive in Beijing on time. Can we still book a tour to the Great Wall for the 20 of November? It’s in 2 days and we arrive at 6:30am and have a 9.5 hour layover. There are 5 of us. Sure, we can book the tour. We just sen you an email, please check.